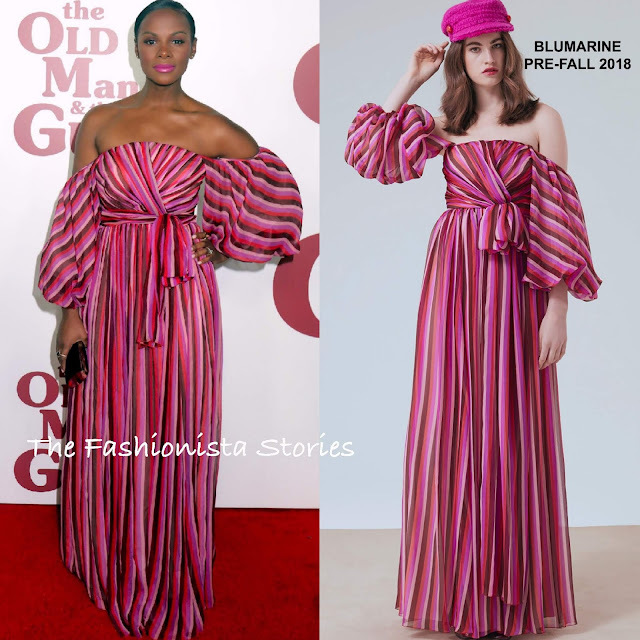 Back on the promo trail, Tika Sumpter hit the red carpet for the premiere of 'The Old Man & The Gun' at the Paris Theatre last night(September 20th) in New York City. The off-the-shoulder trend continues to be a signature look on the carpet and Tika looked beautiful in this BLUMARINE PRE-FALL 2018 pink, burgundy & red stripe gown. Her floor gazing dress which was also tied at the waist, featured another on trend detail, voluminous sleeves. Overall, love the beachy, chic feel and I am here for the direction of her style lately. A flawless beauty look, a small clutch and JENNIFER MEYER jewelry completed her look.